I’m a toucher! In fact one of my top love languages is Touch! There is a great book by Gray Chapman called “The Five Love Languages”, you can google the book and take the test right online, (http://www.the-relationship-coach.com/five-love-languages-quiz.html). Knowing your love language, along with your partners love language is a huge help for a great relationship! Understanding why you touch and knowing why you yearn to be touched brings an a awesome connection between two people. If you are single, taking this simple online test helps you understand what you desire in a relationship. I won’t spoil exactly what the 5 love languages are, take the time and do the test for Yourself! 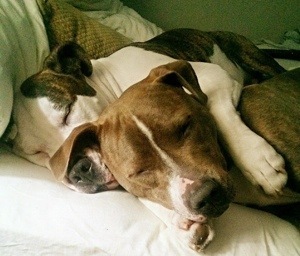 When I saw this picture of these two precious dogs snuggling this morning on FB I couldn’t help but think of Touch being their love language! Even animals love to be touched! 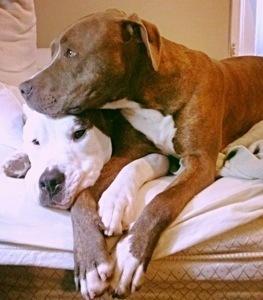 This picture, the look of contentment in the dogs eyes, and their sweet connection put a huge smile on my face and had me in wonder this morning about Love…. Thanks Jordan for sharing your loving dogs!